New fishes, old habits: the rules haven’t changed since Feeding Frenzy. After the success of Feeding Frenzy, they made a second one: Feeding Frenzy Two: Shipwreck Showdown. The game itself isn’t changed a lot from what the first title was: it’s still “eat or be eaten” but there’s som much more now. The game just feels more complete, runs more smootly and even looks better. One of the best thing they added, in my opinion, is the ability to jump off the water in certain levels. 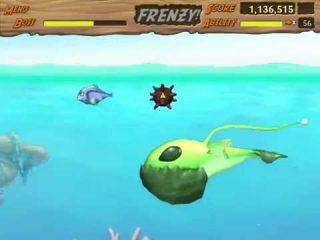 When you jump out of the water you can grap flies which help you grow and even flip in midair to gain additional points. However if you fail a flip and land before it finishes you will get stunned for a while. And of course there are pelicans scouting the surface of the water looking for fishes who like jumping, like you, to eat. Fighting the bad guy of the game: The Intruder. And then there’s this thing over here: a boss to defeat. 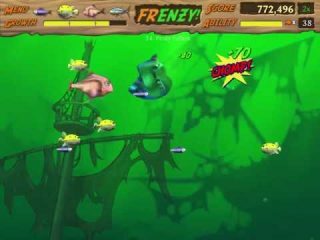 Feeding Frenzy Two: Shipwreck Showdown has actually a real plot where some fishes noted strange behaviors in the seas and so they investigate. Soon they found that all the confusion is caused by an alien fish (the big greenish fish in the above picture) which must be stopped before it reproduces or the life of the reef will be in grave danger! So as you grow up from fish to fish, you eventually encounter this giant fish, and you have to fight it. The fight consist on you truing to lure the boss into a bomb in order to make him spawn a special powerup which you can use to damage him. 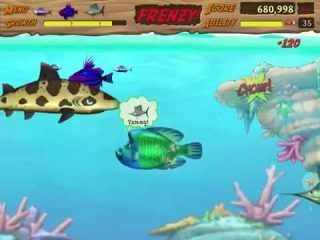 Even though it runs away on the first fight, other fishes continue the chase, reducing the size of the enemy after every fight, until the first fish, Boris, has to finish him off for good. Puffers are still in our way! Thankfully, they are less dangerous now. Apart from that, Feeding Frenzy Two: Shipwreck Showdown, introduced some new powerups like the Shrink Shroom, which shrinks all the fishes which are bigger than you to miniumum size, and the Loonely Lure, which draws away from the screen all the big fishes. There’s also another fish: the Cuttlefish. These guys are really shy, and if you approach them from the fornt they will spit ink at you. Any fish which comes in contact with the ink will have an hard time moving around for a few seconds. But enough talks: have the Let’s Play down here!